Gluten-free, vegan banana bread oatmeal that tastes like the real deal. Get fancy (ok not that fancy, they’re super simple) and add some caramelized bananas and toasted walnuts on top for a gourmet breakfast! When I’m meal planning and making a grocery list for the week, I typically ask Isaac if he has any requests. Sometimes he has a meal request, but the other week he had a snack request: banana bread. I am 100% a sucker for banana bread. I may or may not have three banana bread recipes on my site… I will always and forever treat myself to a slice of banana bread when it’s available. It’s one of those things that I rarely think to make though. So when Isaac requested it, I immediately added the ingredients to my grocery list to make this recipe. I love warming up a slice of banana bread and topping it with coconut oil or a nut butter — it’s a simple breakfast, a delicious snack or, let’s be real, a bomb dessert too. So when I was brainstorming new oatmeal recipes, “banana bread” popped in my head and I knew it was going to be a hit. 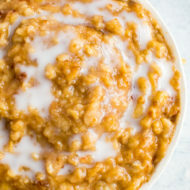 This oatmeal has a delicious base recipe that you can build your own flavors on. I chose to top it with caramelized bananas (yum) and toasted walnuts (double yum). 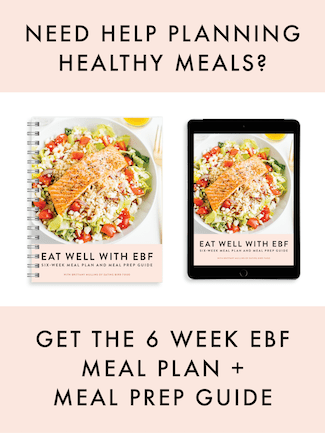 Bonus points: it can be made a high-protein meal by adding in a little protein powder. You could also use these ingredients and make a delicious overnight oats recipe if that’s more your style. I hope you give my new favorite oatmeal a try! 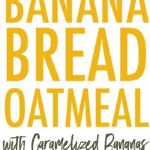 If you make this banana bread oatmeal recipe please leave a comment and star rating letting me know you tried it. This feedback helps me and everyone else who is planning to make the recipe! 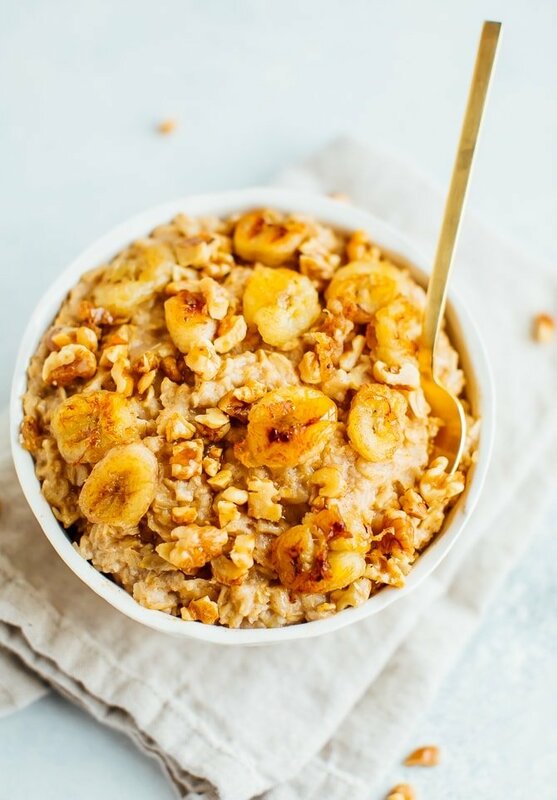 Gluten-free, vegan banana bread oatmeal that tastes like the real deal. 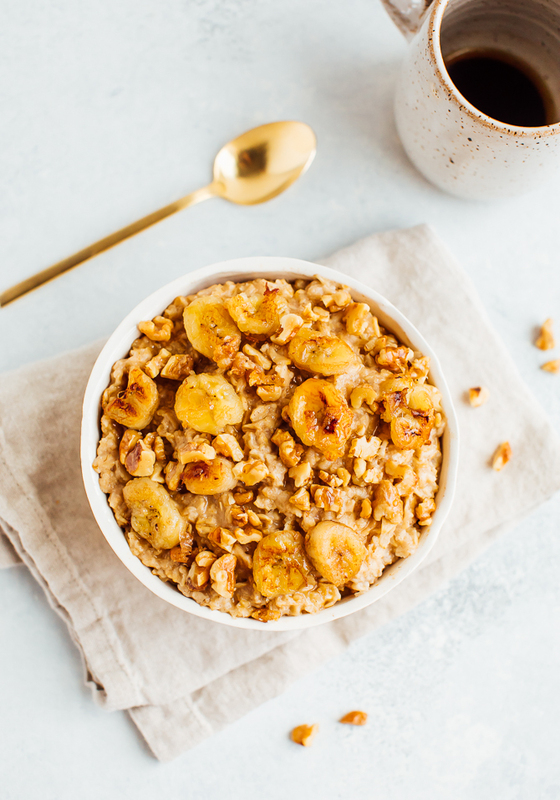 Get fancy (ok not that fancy, they’re super simple) and add some caramelized bananas and toasted walnuts on top for a delicious breakfast! Add oats, cinnamon, vanilla, sea salt and half of the banana slices to a medium pot. Add water and stir to combine. Heat over medium-high heat for 8-10 minutes. Be sure to stir the oats several times while cooking to make sure the banana slices melt into the oats and the oats don’t stick to the pot. You’ll know the oatmeal is done when all the liquid is absorbed and the oats are thick and fluffy. While oats are cooking, heat a skillet over medium and add coconut oil and maple syrup. 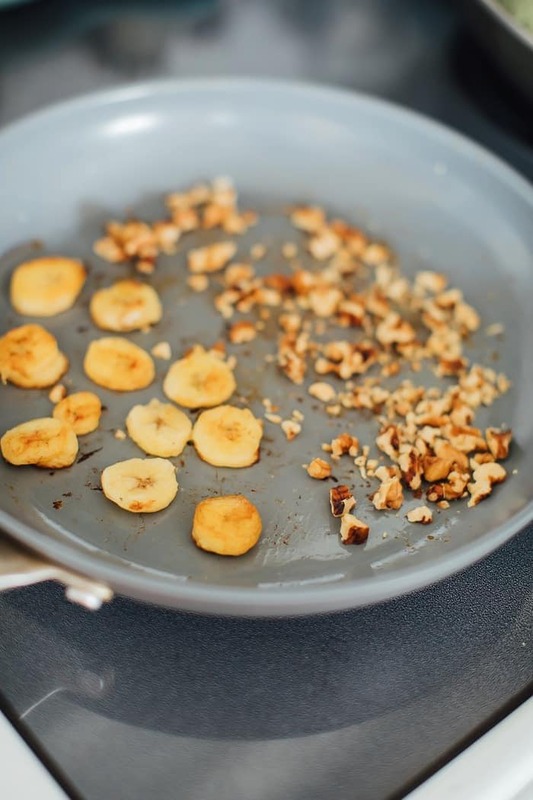 Add remaining banana slices and walnuts to the skillet. Cook banana slices 2 minutes on each side or until they start to get a golden crust. Heat walnuts until just toasted. Remove from heat. 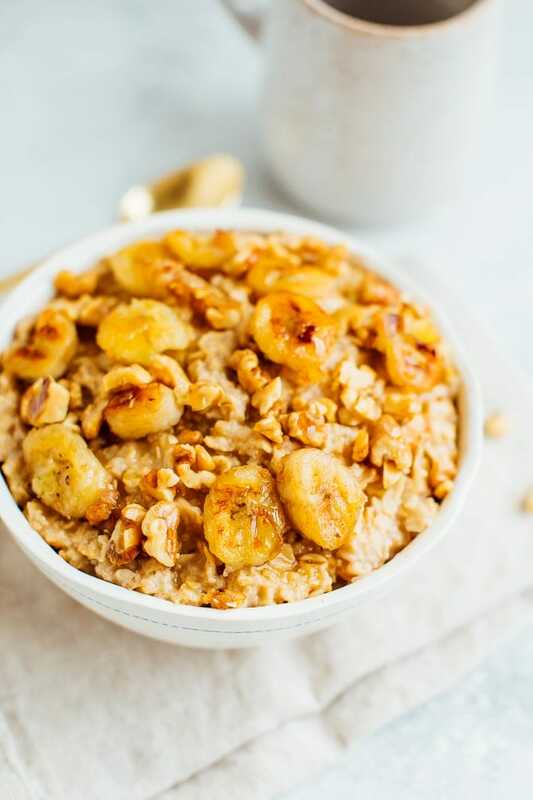 Place cooked oats into a bowl and top with caramelized bananas and walnuts. For sweeter oats, drizzle with extra maple syrup. I like to amp up the protein content by adding ½ to 1 scoop of vanilla protein powder to the oats while cooking. For less sugar, leave out the maple syrup or use a natural calorie-free option like stevia. Sounds delicious. Can I use olive oil instead of coconut oil? Hi Kelly! Olive oil or avocado oil should work fine if you don’t like or use coconut oil. Yum! 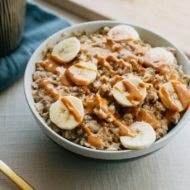 I love the idea to top it with carmalized bananas! Made these for breakfast this week and they were SO yummy! Me and my husband died and went to heaven ? I subbed unsweetened cashew milk for water for a more creamy taste (it was amazing!). I also made a double batch and prepackaged the oats for the week in small storage containers (mason jars work too). Try this, you won’t regret it! Thank you Brittany for sharing such a yummy and simple recipe!! Bonus tip: this is best to eat right after you make it, not bad the next day but loses a little bit of that fresh flavor. 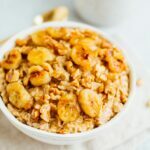 I LOVE oatmeal and bananas so this looks like a perfectly delicious breakfast for me! The vanilla is a great addition.